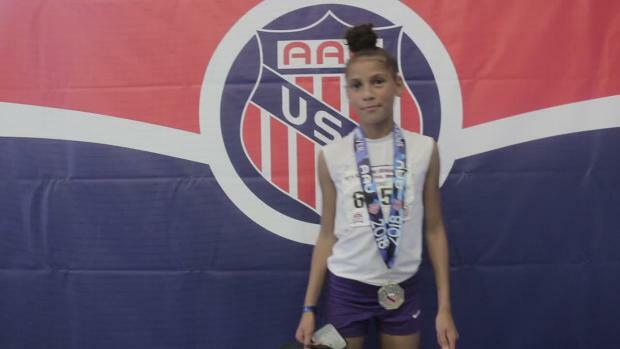 Kylee Turner, who hails from Southfield, Michigan, put in a big performance on day three at the AAU Junior Olympic Games in Des Moines, Iowa. The 12 year old Track Life University representative posted a fast time of 10:39.85 to win the 3000m race by six seconds. This was Turner's fourth crack at the 3000m distance this season and by far her best effort. Her new pr eclipses her previous best of 11:09.50, which she achieved at the AAU Region 12 Qualifier back in June. Turner has posted strong results at a variety of distances in her young career, highlighted by pr's of 1:15.08 (400), 2:31.68 (800) and 5:15.83 (1500). Moving forward, this athlete to watch can draw on her experiences of competing at two AAU Junior Olympic Games. She ran in the 800m event at last year's meet in Ypsilanti.